Notre confortable 2014 Construit cabine invités (KM Ranch Hideaway) se trouve sur 5 acres de terrain, soutenus jusqu'à 7000 acres de terres de l'Etat avec activités de plein air en circulation. Y compris; randonnée, le vélo et l'équitation sentiers à Spencer Mt et des miles de terres de l'État. Regardez par les fenêtres de la chambre à coucher, cuisine et salon pour profiter d'une vue incroyable montagne, vallée et le coucher du soleil. Patio couvert privé avec barbecue et meubles de jardin. Saisonnier foyer. 2-4 dont 1 chambre - oreiller haut-lit queen size et 1 lit queen size canapé. L'emplacement est parfait de refuge situé en retrait de la route principale dans la forêt, sur le sommet d'une colline, mais près de tout. Prenez une agréable balade de 10 minutes en voiture au centre-ville et profiter de tous Whitefish Whitefish a à offrir. 4 juillet - vue exceptionnelle sur affichage professionnel long feu d'artifice de 15 minutes peut être consulté à droite de la cabine. The cabin was clean, quiet and spacious. The location is close to lots of things and activities to keep you busy. We grilled outside which was very nice. We saw wild turkeys and deers in the mornings. The views out the cabin views are beautiful. We even saw a black bear and a grizzly at GNP! I would return to this rental and recommend to friends. We stayed here for a week in September and it was wonderful. 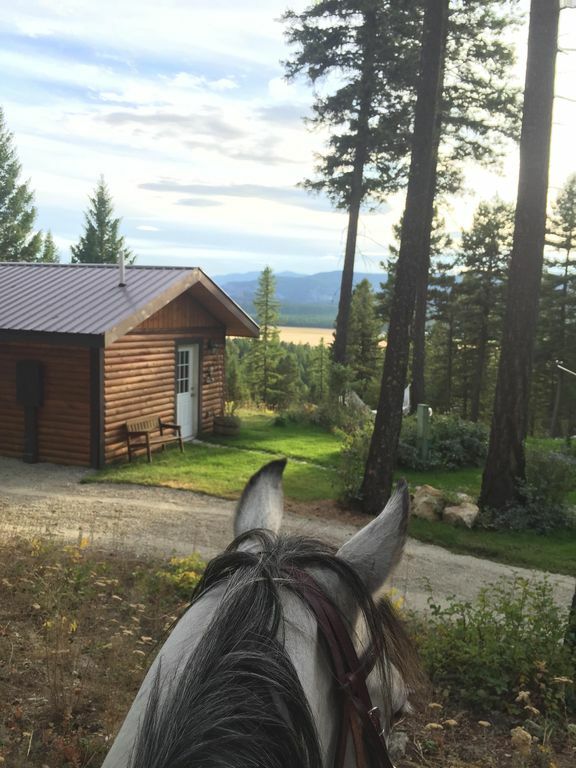 The location feels remote but you're only 10 minutes from Whitefish, which was really nice. The cabin itself is very nice and was well-appointed for cooking (we love to cook). The view is outstanding and it was very quiet. The back porch is nice and feels secluded. There are three things I would change that would result in five stars: we had to contact the owner about what to do about a full trash can on just our second day, then I had to text her again when our trash was full a second time. There should be better instructions about what to do when the trash is full. I don't want to spend time on my vacation communicating about trash. Second, the mattress pad is vinyl or plastic and made A TON of noise when we moved around on the bed. It doesn't breathe, either, so made the bed hotter. It needs replacing. Otherwise, the bed was very comfortable and there were plenty of warm pillows and blankets, which was great since we left the windows cracked at night and it got a little cold! Finally, we had to buy some of our own supplies - tissues, extra paper towels, and dish soap. Due to user error on the coffee machine, we spilled coffee one morning and used most of the paper towels to clean up that mess. There were no extra rolls (there was plenty of TP). We also had to ask for laundry detergent, which was listed as included. These supplies should be replenished more frequently so guests don't run out and have to ask for basics. Great location. Enjoyed the stay. The owners were responsive to any inquiries we had. Curtains over the double doors to block out the sun would have been nice, but that is a minor "complaint". Great little house/cabin with a great view overlooking a valley; tremendous sunsets! Kerris had everything in place for our weeklong stay. Will definitely stay at this property again should we find ourselves coming back to Montana. Simple but lovely, and you can't beat the view from the back porch! Kerris is a wonderful host, and the cabin is delightful. You can literally walk right out the back door and hike for miles. The resident dogs are lots of fun, especially little Pedro who immediately made friends with our dogs and accompanied us on hikes. Don't be surprised to see Stella, the mare, at you door. Kerris describes her as a "large dog" who likes to roam the property. This is the perfect spot if you just want to kick back, relax, and be totally low key. I do volunteer work for Glacier Nat. Park in the summer, and I can be at the GNP west entrance in about 35 minutes.